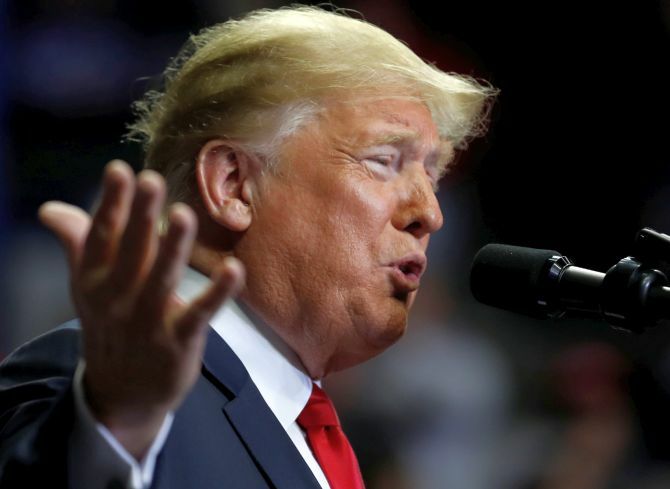 Defending his decision to give temporary exemptions to eight countries, including India and China, from the ban on Iranian oil imports, US President Donald Trump has said it was done so to keep global oil prices down. The US on Monday imposed “the toughest ever” sanctions on a defiant Iran aimed at altering the Iranian regime’s “behaviour”. The sanctions cover Iran’s banking and energy sectors and reinstate penalties for countries and companies in Europe, Asia and elsewhere that do not halt Iranian oil imports. However, Secretary of State Mike Pompeo said that eight countries -- India, China, Italy, Greece, Japan, South Korea, Taiwan and Turkey -- were temporarily allowed to continue buying Iranian oil as they showed “significant reduction” in oil purchase from the Persian Gulf country. “We have the toughest sanctions ever imposed. But on oil, we want to go a little bit slow because I don’t want to drive the oil prices in the world up,” Trump told reporters at Joint Base Andrews outside Washington on Monday before leaving on a campaign trail for the mid-term polls. He, however, emphasised that his effort to keep the oil prices down has nothing to do with Iran. “If you notice, oil prices are going down very substantially, despite the fact that already half of their capacity is gone. But I don’t want to do that,” he said. “I saw some people saying, ‘Oh, why aren’t you tougher on that?’ Well, the sanctions are very tough and I don’t want to lift the oil prices worldwide by clamping down 100 per cent. It will be gradual,” the US president said. However, the Democratic Party leadership criticised Trump for giving exemptions to some of the major Iranian oil importers. “These exemptions are premised on significant reductions of Iranian oil imports by countries such as China and Turkey when there is minimal evidence of such reductions. This waters down the integrity of sanctions and communicates to the rest of the world that others do not have to abide by the US restrictions,” he said. Hoyer alleged that by “tearing” up the Joint Comprehensive Plan of Action, the Trump administration has isolated the United States and undermined the multilateral efforts to curb Iran’s “dangerous” behaviour. US National Security Advisor John Bolton claimed that the 2015 nuclear deal with Iran failed to permanently block all paths to an Iranian nuclear bomb. US President Donald Trump had in May pulled out of the landmark Iran nuclear deal, an Obama-era accord which he has repeatedly criticised as “disastrous”. “This administration’s reckless withdrawal from the JCPOA has squandered our best opportunity to prevent a nuclear Iran, moving us closer to a military conflict that the American people don’t want – all while undercutting our most importance alliances abroad,” he said. But Senator Bob Corker, the chairman of the Senate Foreign Relations Committee, said the Trump administration deserves credit for re-imposing sanctions and dramatically reducing Iran’s oil exports and revenues. Imposing maximal economic pressure on Iran is vital for getting Tehran back to the table, he said.